Notes: Once again, I’ve been slacking with these posts pretty hard. Honestly I haven’t really been changing pens or inks around too much with my busy schedule. I recently did a mass cleaning of every pen that I have that’s not put away in a box to prepare for the Long Island Pen Show. Something told me that I didn’t need 6 Safaris / Al-Stars loaded up with different ink if I was going to be bringing some new stuff home. Anyway, into the carry… I’ve really been enjoying the Iroshizuku Take-Sumi, it’s a nice dark shade of black with good flow and saturation. 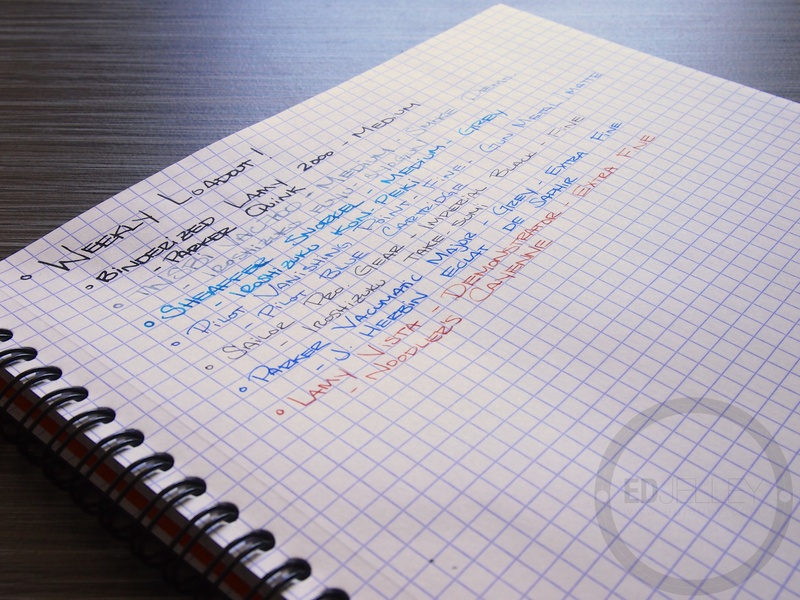 It follows suit with the rest of the Iroshizuku line, I just don’t know if I want to spend $20+ on a black ink (again.). Next in line is the Parker Vacumatic, which I picked up at the show. I’ve already written/doodled around 10 pages with this pen and it’s great. The nib is super smooth and provides a small amount of flex. Next up is the Gun Metal / Matte Black VP I picked up from Richard Binder’s table. Since I saw the announcement of the new colorway, I knew I had to have it. I already had an extra nib unit so I opted for body-only. It’s a great pen, I just think I need another nib unit, this time from Richard Binder as opposed to Amazon. Next in line, another pickup from the LI Pen Show, a NOS Sheaffer Snorkel Admiral. This pen looks brand new, and still has the sticker on it. It writes wonderfully and the snorkel works great. Honestly, the only reason I wanted a Snorkel was for the filling mechanism, but this one happens to write great too. 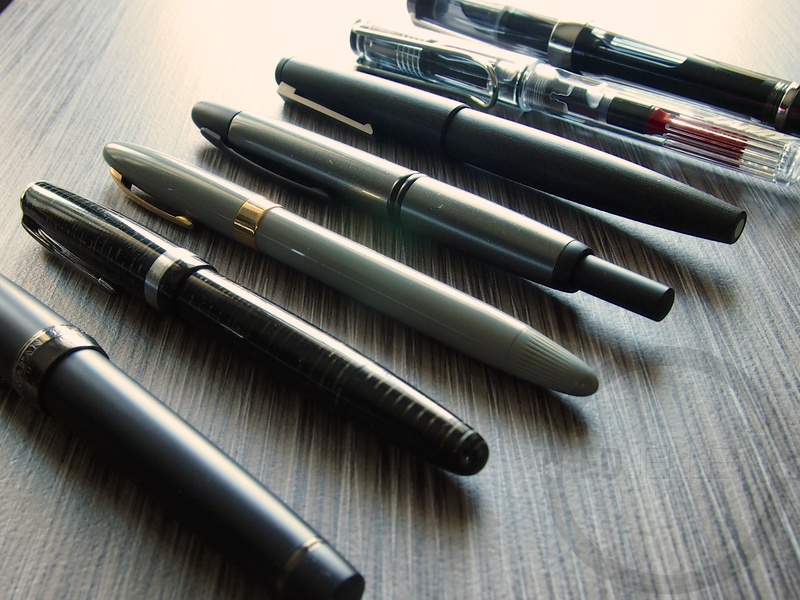 Onward to the Lamy Vista.  I was lucky enough to be the winner of the Office Supply Geek / Goldspot Pens monthly newsletter giveaway. In the package, I chose the Vista, Noodler’s Cayenne ink, a Rhodia Large Webbie in dotPad, and they were nice enough to throw in some free Ink Journal notebooks. My Lamy 2000 is in rotation because while at the show, I got it adjusted by Richard Binder (Binderized, if you will…) and it writes simply perfect. The flow is great and the nib is smoother than it was before. Overall, the pen performs much better than it did, and I couldn’t be happier with it. Expect a review of the Lamy 2000 this upcoming week. The last pen I’ve been carrying is my new TWSBI Vac700. I was really interested in getting a vac filler and the TWSBI fit the bill. The new JOWO nib writes super smooth and lays down a consistent line. I’m in the process of reviewing this one, so keep an eye out in the coming weeks. Overall, I’m really happy with the all-star lineup I have going on right now. I think all of my needs are covered and I’ll be keeping this configuration for a while. Thanks for reading! I am still taking submissions for your Weekly Loadouts! Click here if you would like to share what you carry! The “TRADING POST” is still being populated with lists. The Trading Post is a place where you can submit a list of pen stuff you want to trade, complete with a custom contact form to make life easier! The nibs are roughly the same size (#6). Now the Sailor is bigger. I had to use a bobby pin to keep the TWSBI from rolling, that’s not a clip or anything! The nibs look more gold than they really are, courtesy of the sun. 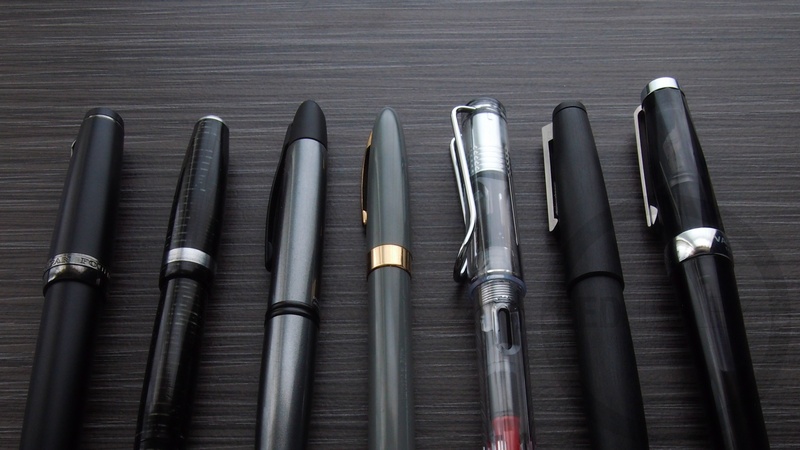 I’ve got a couple of those pens, Lamy 2000 ( Binderized M + OB), VP (M + Binderized 0.8mm Stub), Lamy Vista [/Safari/Al-Star] (various nibs). Wondering if you could briefly compare those to the Vac 700 and the (no don’t look at it, gah!) Sailor. 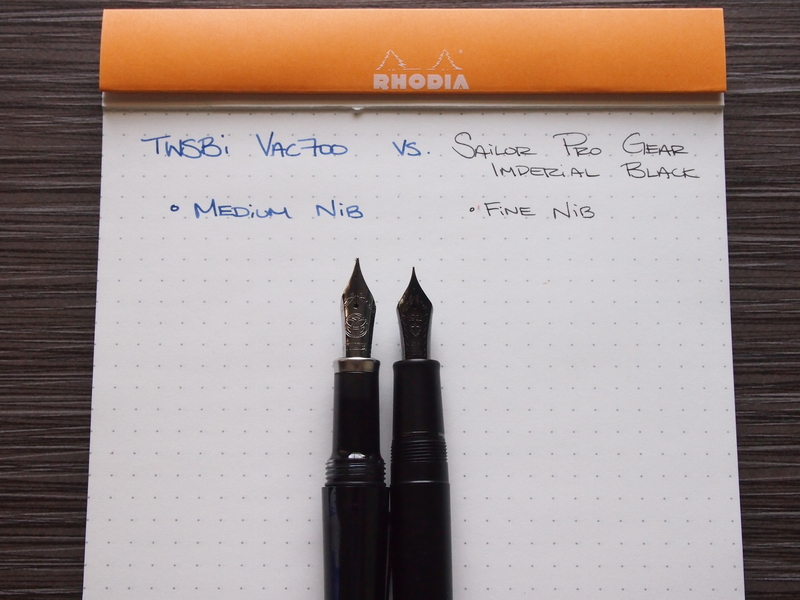 You already know of my lust for the Sailor and I’ve been considering a Vac 700 for a while to round out my TWSBI collection, plus I’d get to play with a vac filler. I took a few pictures of the two side-by-side for you. They’re both pretty different from each other, right down to the way the plastic feels. 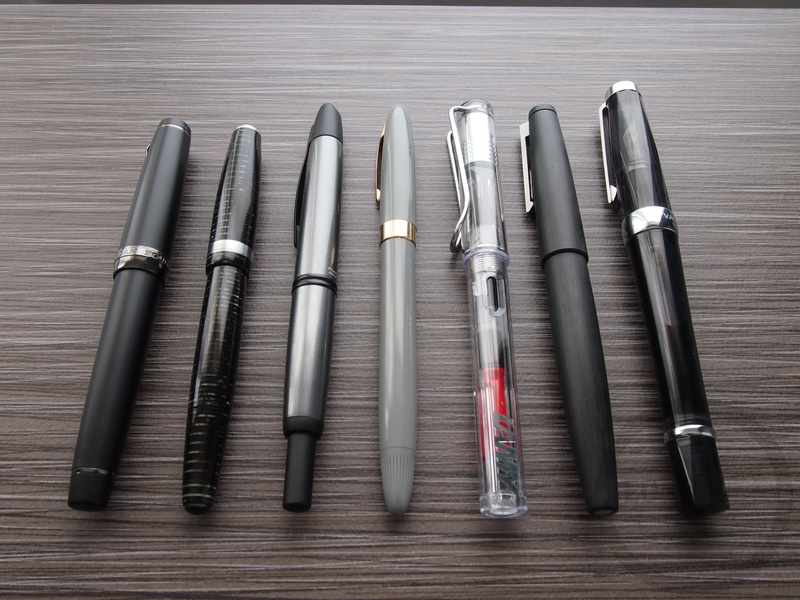 It’s tough comparing two pens with way different price points, different nib materials, different filling systems and different nib widths. 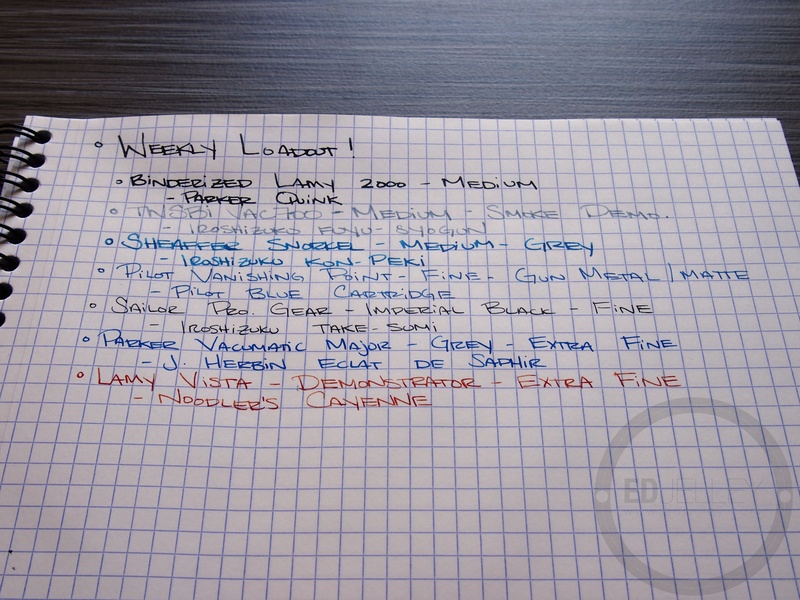 I was quite surprised by how substantial the VAC feels in hand, so I ended up purchasing it at the LI Pen Show. 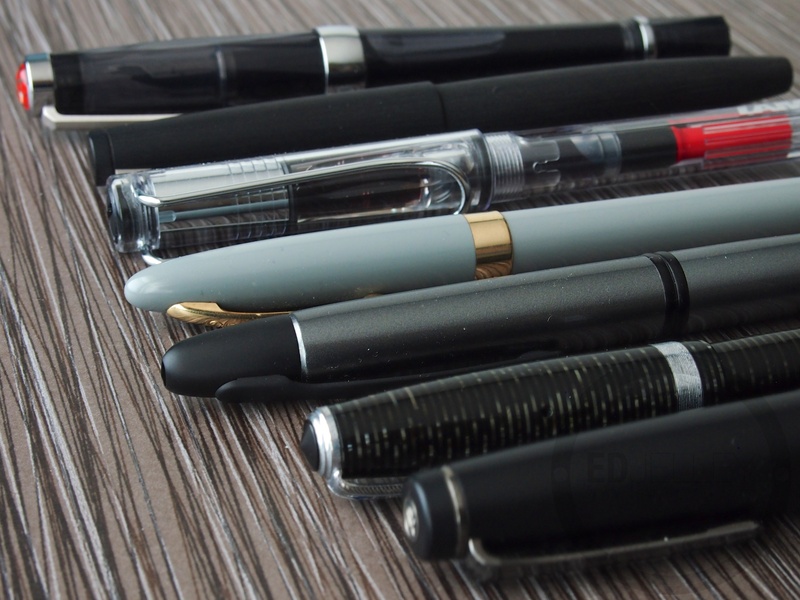 I was between that and the Pilot Custom 823 vac-fill, and I liked the feel of the TWSBI better. 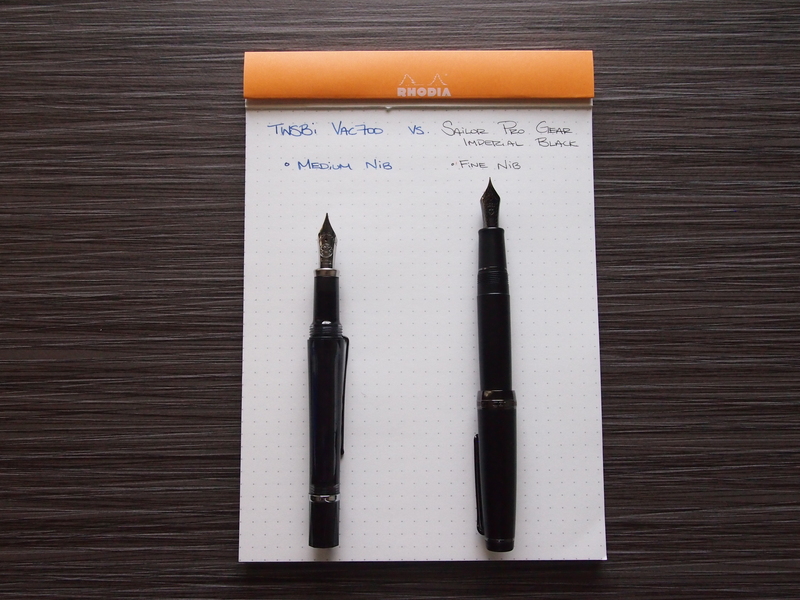 The TWSBI is a great value, and with the nibs finally where they should be, I can recommend the pen. The Sailor on the other hand is an amazing pen. Every time I pick up the pen it’s immediate enjoyment. The nib is so smooth, especially for being so fine. I don’t mind that the pen is a C/C filler, because it really does the same job of getting the ink to the paper. It’s my favorite pen to look at, and the details are top notch. The main difference is the size of the pen. I prefer to write with the Sailor posted and the TWSBI not. 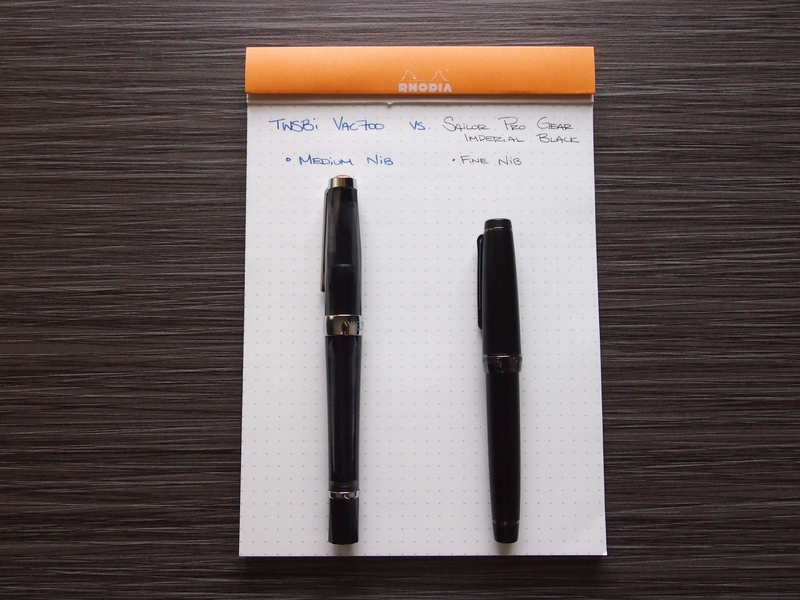 The Sailor becomes a bit longer than the TWSBI when posted, but is much smaller when capped. 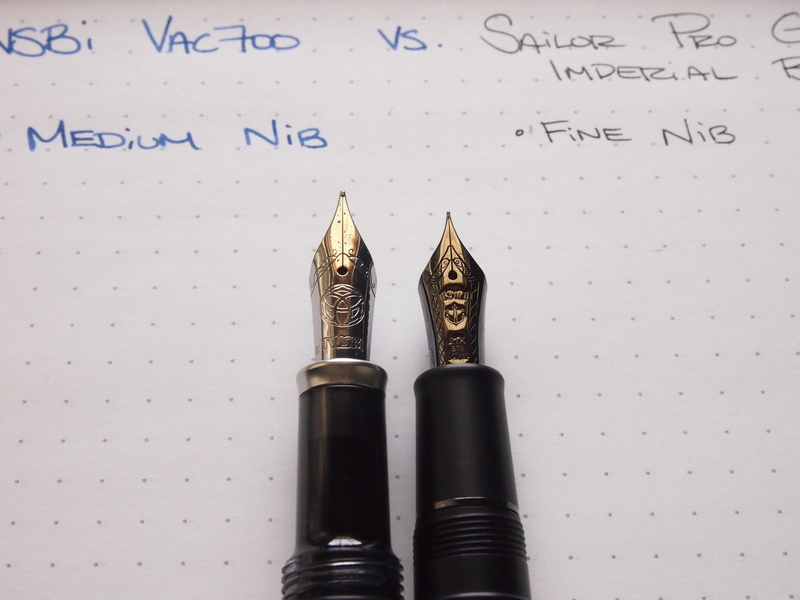 The nib sizes are roughly the same, but the Sailor is plated gold. Let’s be honest here, if you’re lusting over the Sailor, you’re probably going to end up with one at some point, but until you can pull the trigger, the $85 for a TWSBI VAC is certainly money well spent. Thank you! It’s much better after getting the Binder treatment. The tines were misaligned and needed a little smoothing. I think it was just a dud from the factory, I’ve heard of people getting faulty Lamy 2000s before and I guess I was one of them. Thanks for reading!